Introduced in 1976, the Porsche 934 was essentially a Group 4 GT race version of the Porsche 930 Turbo road car. Having qualified for Group 4 by building a minimum of four hundred 930 Turbos in two consecutive model years, Porsche then built thirty-one 934 race cars. Taking a standard, galvanized 930 bodyshell the 934 was built-up with an aluminium roll-cage fitted and the cockpit left bare, except for a single, RSR-type driver’s race-seat with safety harness and some extra gauges for boost pressure. The engine output could be varied between 480 and 560bhp using an adjustable wheel on the dashboard and with a homologation weight of 1120kg, every bhp had only to move 2kg. A disadvantage to the performance was turbo-lag and drivers had to get used to accelerating before the apex using a 4-speed transmission, instead of 5-speed. The car was otherwise similar to its production 930 counterpart and the rules stated that the 934 had to retain the same engine spoiler as the road car and therefore could not be fitted the bulky air-to-air intercooler as used on the works 2.1 Turbo RSR. Instead Porsche devised a clever method for cooling the charged intake gases using water radiators mounted in the front spoiler which fed water back to the engine compartment where two cooler-cores were fitted, above which air came in through a finned plenum-chamber lowering the temperature from 300° F to 120° F.
The Porsche 934 was a racing version of the Porsche 911 Turbo, prepared to FIA Group 4 rules, similar to the Porsche 935 which was prepared to FIA Group 5 rules. 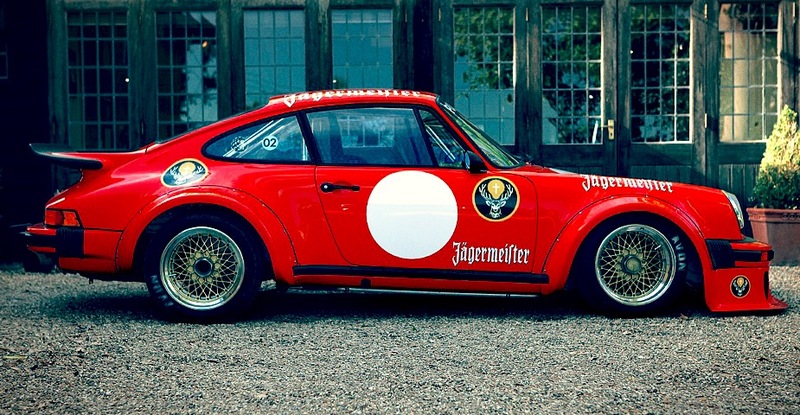 The Porsche 934 was introduced for the 1976 racing season. It was manufactured for two years, 1976 and 1977, with at least 400 being manufactured. Toine Hezemans drove this car to victory at the European GT Championship, while in the U.S., with George Follmer at the wheel, it also became the Trans-Am champion. It continued to win races throughout the late 1970s. The 934 as well as the 935 were raced in the Deutsche Rennsport Meisterschaft in a distinctive orange “Jägermeister” livery. Rally Car for Sale – 1970 Porsche 911 – 2005 rally conversion.